DMO has launched a new version of its well-known Kerr effect magnetometer ‘NanoMOKE’. 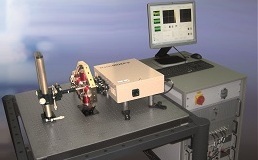 NanoMOKE3 is the world’s first true hybrid Kerr magnetometer-microscope. Based around an ultrastable focused laser spot, hysteresis loops with an excellent signal to noise ratio can be acquired within seconds. The new feature of NanoMOKE3 is that the laser spot can be rastered at high speed by a pair of built-in moving mirrors, allowing domain images to be acquired at near-video rate. This is a significant improvement on conventional scanning Kerr microscopy which usually takes several minutes to acquire one frame.